If you carry people more often than stuff, you'll be better served by the award-winning four-door Elantra than the hatchback GT. It has less interior space than the sedan of the same name, but much more cargo room. Not quite a hot hatch, the 2016 Hyundai Elantra GT gives up some rear-seat space in the name of cargo room and European style. The Hyundai Elantra sedan has risen from the ho-hum ranks to become one of our more well-liked compacts, in part due to its grown-up styling and improved feature set. Its handsome, economical traits combined with a solid safety record help it outshine stalwarts like the Honda Civic and Toyota Corolla in some measures, all the while surpassing most of the field when it comes to value. The Elantra is also offered in five-door GT hatchback guise, which is covered separately. For two model years in this generation, Hyundai also offered a two-door Elantra, but slow sales of that model prompted its end last year. In a relatively mild rework to the Elantra sedan lineup in 2014, the accomplished styling of the current car received new front and rear end treatments, with LED fillips around the headlamps on Sport and Limited sedan models. The Elantra wears a complex set of curves that collect in a swoop toward the rear end, where the boomerang door cuts give the look a shove forward. It's an energetic exterior backed up with a daring cockpit, with an hourglass center console defining the space and doubling as a comfy knee rest. 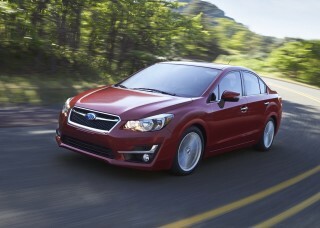 Base Elantras are lean and efficient, with a 1.8-liter inline-4 standard. Rated at 148 horsepower and 131 pound-feet of torque, this powertrain is fairly smooth and accelerates respectably through a 6-speed automatic or a 6-speed manual. There's also a 2.0-liter inline-4 in the Elantra Sport, with 173 hp and 154 lb-ft of torque. It is also available with either a manual or automatic. 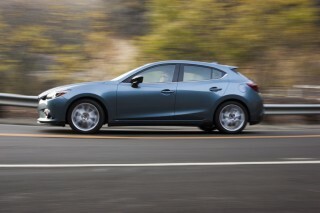 Generally, the Elantra doesn't feel as energetic or engaging as the best drivers in the class—the Mazda 3, for example. Its powertrains are slow to respond to throttle inputs, and the steering could be quicker and more responsive, while it has been improved with better on-center feel, it's feedback is still not especially natural. Ride quality is fine, however, and the Elantra soaks up road noise as well as or better than its competitors, with sound levels about as low as in some mid-size sedans. That's an important metric for the Elantra, since its interior space spills over into mid-size territory. The Elantra is an excellent value on many fronts. By its spec sheet, it's a mid-size vehicle, and it shows. The sedan's front seats could use a little more bolstering and lateral support, as in the coupe, but on either, they're surrounded by ample space in all directions. In back, the leg room is fine for adults, but head room can be tight, even for medium-height passengers. The Elantra's interior has lots of useful cubbies and storage bins, including a covered one that sits ahead of the shift lever: it also contains the aux jack, a power point, and the USB port in an easy to reach module, perfect for connecting smartphones. All Elantra sedans are rated at five stars overall by the NHTSA. The IIHS called it a Top Safety Pick in prior years, with an "Acceptable" rating in the new small-overlap test and "Good" scores in all other categories. The Elantra sedan lineup now includes the SE, Value Edition, Limited, and Sport models. All Elantras come with power windows, locks, and mirrors; keyless entry; and (on automatic models) air conditioning; cruise control; Bluetooth with audio streaming; and telescopic steering. All versions can stream audio via the Pandora app and a USB connection. A 4.3-inch touchscreen radio with a rearview camera is now standard on the Sport and Limited sedans, and an option on the SE. For 2016, Hyundai has made several price-focused packaging changes. A new Elantra Value Edition does exactly what the name implies, saving buyers a cool grand with packaged content. For just $550 more than the price of an Elantra SE, the Value Edition includes different 16-inch alloy wheels, a power tilt-and-slide sunroof, leather coverings for the steering wheel and shift knob, proximity key with keyless ignition, heated front seats, chrome beltline molding, aluminum sill plates, turn signals integrated into the side mirrors, and a tilt-and-telescope steering wheel. The Elantra Limited now comes with proximity key and dual-zone auto climate control as standard, which represents a $600 savings. And the Elantra Sport does away with its previously standard leather seats and power sunroof to get a lower starting price. Elantra sedan fuel economy tops out at 28 mpg city, 38 highway, 32 combined for the automatic 1.8-liter; the least-efficient variant carries a 24/34/28 mpg rating. The 2016 Hyundai Elantra is one of the more captivating designs in its class on the outside, although its interior is no longer at the leading edge. When it first launched, the current Hyundai Elantra marked a styling sea change for the automaker. It took themes established on the the bigger Sonata sedan and re-crafted them into a flawless compact profile, in the process flipping the Hyundai compact range out of the design doldrums and into the fashion-forward set. From front to back, it's an effort that brims with confidence. From almost every angle, the Elantra sedan looks like it's already in motion, which tends to be a sign of good car design. It is here, anyway. The rear door cuts are particularly effective cues that seem to pull the shape taut for release, like a bow pulled back waiting to release an arrow. The whole car looks to have been detailed with an expert eye, from the way the marker lights extend over the front wheel centers, to the steep cant of the windshield, to the crease that runs down the body, softening at the C-pillar. We also admire the rising shoulder line that emerges from smooth sheet metal just inches behind the lipped wheelwells and flows into the taillights. There's nothing particularly sporty about the lines as much as they are sophisticated, a theme that is not common among youth-oriented cars of its size and very much welcomed here. There's a lot to like here. Given the Sonata's recent retreat into conservative territory, the Elantra is now one of Hyundai's most daring pieces of work, right there with the funky Veloster hatchback. It's our hope that the next Elantra keeps the distinctive look that helps it stand out from the veritable sea of compact sedans available now. The exterior's design triumphs are matched by some great execution in the cabin, albeit in a more subdued manner. The unfettered swoops of the exterior are toned down in the right way inside; the curves are there, just pulled in more compelling and cohesive ways. The pinch point where the center console meets the rest of the dash is brilliant; the hourglass shape isn't just fresh and distinctive, it's a perfect area for resting knees that usually get a hard ridge and no apologies. That's just one cue in a design from a brand that's had few visuals all to itself in the past. Acceleration is just adequate for the 2016 Elantra, and performance overall is capable and confident but not exciting. The Hyundai Elantra is a pleasant vehicle to pilot in traffic, but it falls a little short of the performance offered by rivals from Volkswagen, Mazda, and Ford. That said, it's an above-average effort that drives at least as well as the latest Toyota Corolla. The Elantra remains lean and efficient, with a 1.8-liter inline-4 standard in the base SE sedan and in the Limited. Rated at 148 horsepower and 131 pound-feet of torque, this powertrain's fairly smooth and accelerates respectably through a 6-speed automatic or a 6-speed manual. Generally, the Elantra doesn't feel as energetic or engaging as the Ford Focus, though, because its throttle is slow to respond to inputs. Even so, the Elantra has a smooth idle, and stays calm throughout most of the rev range, an achievement that eludes larger four-cylinders and wasn't particularly a Hyundai strength in the past. In the Elantra, the four's right at home in the 2,500- to 4,500-rpm range, where it'll be pretty much whenever you're increasing speed with the responsive 6-speed automatic transmission, which will be far more popular than the perfectly fine 6-speed manual. Manuals get an ECO shift light, while automatics have an Active ECO mode that slows down shifts and throttle to boost fuel economy up to 7 percent. 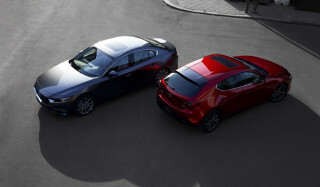 To add some luster to the spec-sheet numbers, a Sport trim for the sedan comes with a 2.0-liter inline-4 shared with the Kia Forte. In the Elantra sedan, it's good for 173 hp and 154 lb-ft of torque, up 23 hp and 25 lb-ft from the smaller inline-4. We still haven't been able to drive an Elantra four-door with the new 4-cylinder engine, though in the Elantra GT hatchback it's more notable for extra engine noise than an improvement in acceleration. 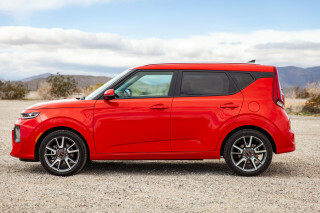 The Sport model comes with a round of handling changes that include stiffer shocks and springs and a bigger stabilizer bar. The finer inputs are what separates the Elantra from those other compacts. 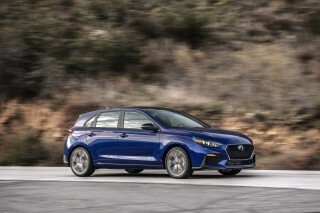 Its steering isn't especially natural in its feedback, though the wandering common to first- and second-year Elantra sedans has mostly been filtered out. Ride quality is sporty without feeling overly firm, and the Elantra comes with standard four-wheel disc brakes and a firm pedal feel—better than the cost-cut rear-drum setup that's now so common in this class. For 2015, all Elantra sedan models received selectable three-mode steering and revised steering feel; the modes provide different levels of heft for the wheel, but none of them really sharpen up the feedback on this electric rack. Interior finishes are impressive—and in general a bit better than what budget-minded shoppers might expect. Although the Hyundai Elantra is marketed as a compact car, its interior volume actually puts it in the EPA's mid-size class. That can be an important factor to consider for those looking for a roomy compact or even a less expensive alternative to the typical family sedan. Size-wise in the compact class, the Elantra is up there with the VW Jetta—and a world away from the very tight accommodations you'll find in a Ford Focus or a Mazda 3. Throughout the interior, you'll find plastics that are about par for the class—a mix of hard, scuff-resistant and soft-touch surfaces—and there are lots of useful cubbies and storage bins, including a covered one that sits ahead of the shift lever: it also contains the AUX jack, a power point, and the USB port in an easy to reach module, perfect for connecting smartphones. The leather that's available on sedans is perforated in a wave pattern and won't be mistaken for luxury hide, but it feels supple enough. The Elantra soaks up road noise better than most small cars (in part because of its soft suspension calibration), and at 70 mph it's not much different than in a 4-cylinder mid-size sedan. The Elantra's generous proportions are put to good use. In the front seats, leg room and head room are fine for even large adults. We would like to see better support baked into the front buckets, though, in the form of more bolstering and more bottom-cushion support, as well as some more length on the bottom cushion for long-distance touring comfort. The leaner head room in the back seat is where the Elantra's compact positioning is most obvious. It's no worse than with most in the class in this respect—Volkswagen's Jetta is the standout here, with its outsized rear accommodations. Legroom in back is good, and it's easy to slide into the four-door's back bench. The Elantra gets kudos for offering rear-seat heaters, but it lacks air vents to provide warm air from the car's climate control system in back—common with most vehicles in the class, and some larger vehicles like the VW Passat. The Elantra is still missing automatic-braking hardware, although its safety scores are mostly good. Since its introduction for the 2011 model year, the current generation of the Elantra has been engineered to perform better in crash testing. That said, some testing requirements were tightened in recent years, leading to a slight decrease in the Elantra's overall standing. At this point, it is not the top performer in its segment, but still turns in respectable ratings. The Elantra comes with standard stability control; anti-lock brakes with brake assist; a new Steering Effort Assist system that helps steer you back toward stability and control in a skid; front seat-mounted side airbags; and front and rear side-curtain bags. A rearview camera system is also available, although outward visibility is quite good in the sedan even without it. Federal safety officials give the Elantra sedan five stars overall, with a four-star rating for frontal impacts and rollover resistance, and five stars for side impacts. In testing over at the IIHS, the Elantra sedan has earned the Top Safety Pick accolade in previous years, including top "Good" ratings in all categories of testing—including the new roof-strength test—except for an "Acceptable" rating in the new small-overlap test. The 2016 Hyundai Elantra Limited remains a deal if you must have leather and the works, but a new Value Edition and the basic models are tops for the cost-conscious. Thanks to tweaks made for the 2016 model, the Elantra improves on its already great value, with a list of standard features that can make the more expensive models seem unnecessary. For 2016, changes include new Elantra Value Edition trim, added content for the Limited model and a couple of items removed from the Sport's standard list to bring the price down. 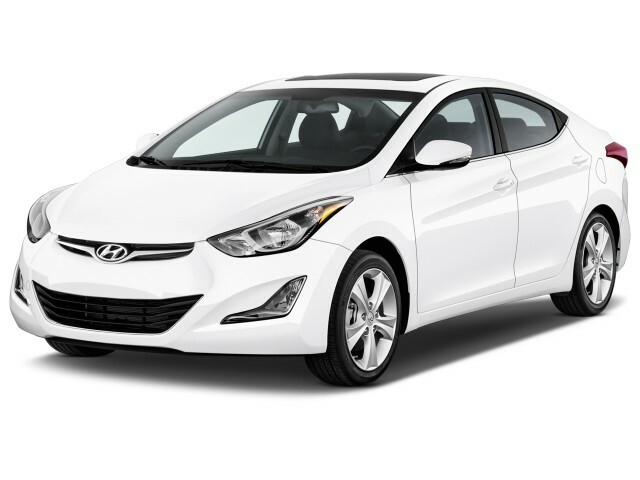 On the base Hyundai Elantra SE sedan, you'll find standard cruise control; an AM/FM/CD player; a USB port; Bluetooth with streaming audio; keyless entry; power windows, locks, and mirrors; and on automatic transmission cars, air conditioning and telescoping steering. Next up is a new Value Edition trim, which does exactly what the name implies, saving buyers a cool grand with packaged content. For just $550 more than the price of an Elantra SE, the Value Edition includes different 16-inch alloy wheels, a power tilt-and-slide sunroof, leather coverings for the steering wheel and shift knob, proximity key with keyless ignition, heated front seats, chrome beltline molding, aluminum sill plates, turn signals integrated into the side mirrors, and a tilt-and-telescope steering wheel. 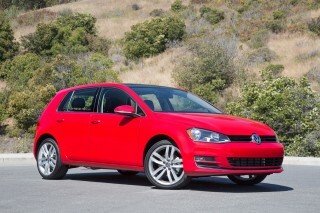 The Sport model, with its 2.0-liter engine, is available with a manual or an automatic for an extra $1,000. It is equipped similarly to the Value Edition package, but with slightly more content. For 2016, the Elantra Sport does away with its previously standard leather seats and power sunroof to get a lower starting price. On the top trim level, the Limited, the Elantra comes with heated front and rear seats trimmed in leather; 17-inch wheels; fog lamps; a sunroof; and turn signals mounted in the mirrors. From that equipment level, an optional Premium Package brings keyless ignition with a proximity key; an upgraded audio system; and a navigation system. For 2016, the Limited now comes with proximity key and dual-zone auto climate control as standard, which represents a $600 savings. If you're in need of directions frequently, the Elantra's navigation system has one of the largest LCD touchscreens in the class, and it's beautiful to look at and to use, with voice recognition for phone, audio, and and destinations, plus real-time traffic and weather. A rearview camera comes with the navigation system, too, and it also builds in XM NavTraffic, NavWeather, Sports and Stocks integration, 16 GB of memory, audio streaming and satellite radio capability, and the capability to play JPEG or BMP slideshows from thumb drives. To help make the assembly and ordering process simpler, the Elantra sedan is offered in a limited number of build combinations. The downside of this strategy is that there are holes in availability of popular features. You can't get the navigation system if you want a manual transmission, for instance. The telescopic adjustment is optional on manual-transmission cars, bundled in as part of a Popular Equipment Package. Fuel efficiency isn't one of the strong points for the 2016 Elantra—either absolutely or within its class. The Hyundai Elantra sedan posts solid fuel-economy ratings, although it's not at the head of this constantly evolving class. 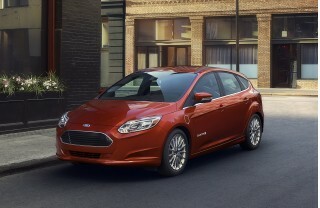 One reason is that it lacks a specific model with aero improvements to reach the 40-mpg bogey. Its competition offers special versions with aerodynamic tweaks, even different powertrains, to hit the magic marketing number, while others are newer and simply more fuel efficient in all trims. 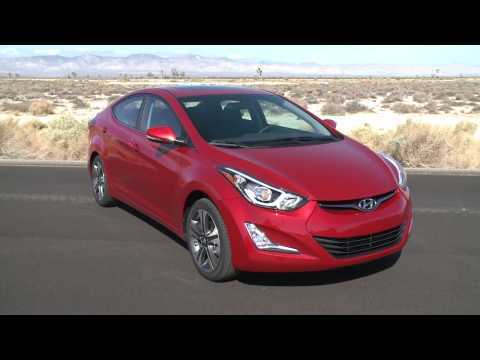 The 2.0-liter inline-4 in the Sport returns the worst ratings of all Elantras. 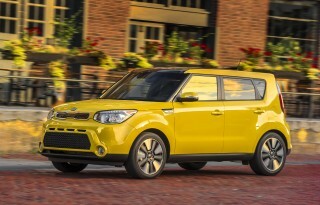 The automatic earns EPA ratings of 24 mpg city, 35 highway, 28 combined, while the manual loses just one mpg in the highway test, for ratings of 24/34/28 mpg. With the manual transmission, the Elantra with the standard 1.8-liter engine is also rated at 27/37/31 mpg. This is my 2 Elantra the first a 2013 I and was planning to get the 2017. After the test drive the 2017 is amazing. But the 2016 price is a winner 11,988.75 for a new car. Hands down the best value on the road. This is my 2 Elantra the first a 2013 I and was planning to get the 2017. After the test drive the 2017 is amazing. But the 2016 price is a winner 11,988.75 for a new car. Hands down the best value on the road. The Elantra is a decent car, but Hyundai completely left of the extra features found in other models. The Elantra has a smooth ride but the steering is very touchy. It actually gives you a good workout keeping... The Elantra is a decent car, but Hyundai completely left of the extra features found in other models. The Elantra has a smooth ride but the steering is very touchy. It actually gives you a good workout keeping it on the road. I found the seats are cheaply made and they only offer leather in the Limited edition. If you like starting the car with the key fob then look else where. Hyundai doesnt offer this option and they send you to the Bluelink feature that isnt worth 2 cents. Bluelink works maybe 2 out of 10 tries and if you dont continue the yearly subscription they disable it permanently which causes you vehicle to lose value. I own a 2013 Elantra Gt GLS. Gas mileage not what they say. Noisy inside the vehicle. Good looking car and nice to drive. I'm three week into to owning my car and am [this] close to taking a loss to get into something more comfortable. After the first 20 minutes, the seats feel as hard as rocks and the lumbar support virtually... I'm three week into to owning my car and am [this] close to taking a loss to get into something more comfortable. After the first 20 minutes, the seats feel as hard as rocks and the lumbar support virtually non-existent. Sadly, this was not noticed in the excitement of the test drive. My first ride other than in and out around town was 75 miles each way. In LA traffic, that's about 1.5 hours. I was constantly shifting position trying to get comfortable and take the strain off my lower back. I am weight & height proportionate, so there really shouldn't be an issue. I get out the car moaning and groaning, and walking like an old lady! I have tried every position I can think of to make the seat more comfortable, and as of tonight, ordered a sheepskin cushion, PRAYING this will help! I took 1 star off for performance as I find it tends to be a bit sluggish if you gradually depress the gas pedal. Put too much pressure on it from a dead stop and you take off like a bat out of hell. The car has a lot of bang for the buck and I love its sporty look, but so far it's not the match made in Heaven I was dreaming of. If this is a car you are seriously considering, try renting the model you are thinking of for a weekend as my understanding is the seats do differ. Love it! It room to put things. I was looking for a better car than the 2013 corolla because my family was squashed in it. The dealer had me test drive the 2016 elantra and I enjoy it my family loves it. absolutely wonderful car, dependable, appearance, great gas milage, smooth ride.